Hurricane Sandy struck the east coast five years ago this month. We take a look back at some of the devastation from the days the storm first hit. 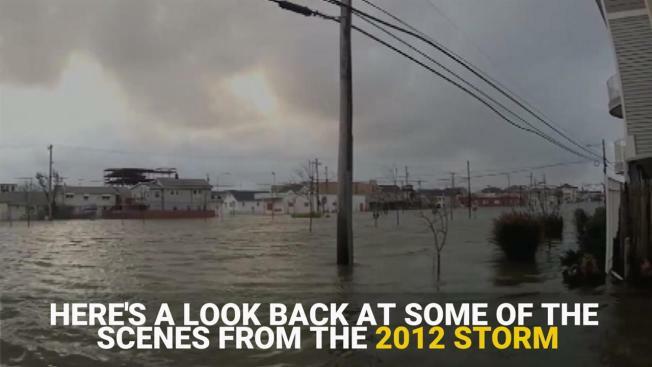 See some of the most dramatic moments from Sandy captured on video, from fire devastation in Breezy Point, Queens, to an aerial tour of New Jersey in the immediate aftermath of the storm to daring rooftop rescues on Staten Island. This story was originally published on Oct. 29, 2014, two years after the storm. The NYPD released video of several daring rescues from Staten Island rooftops as Sandy's floodwaters surrounded homes. Aviators of the 1-150th Assault Helicopter Battalion, New Jersey National Guard, look for displaced residents along the New Jersey coastline Oct. 30, 2012, in the aftermath of Sandy. Aviators of the 1-150th Assault Helicopter Battalion, New Jersey National Guard, look for displaced residents along the New Jersey coastline Oct. 30, in the aftermath of Sandy. 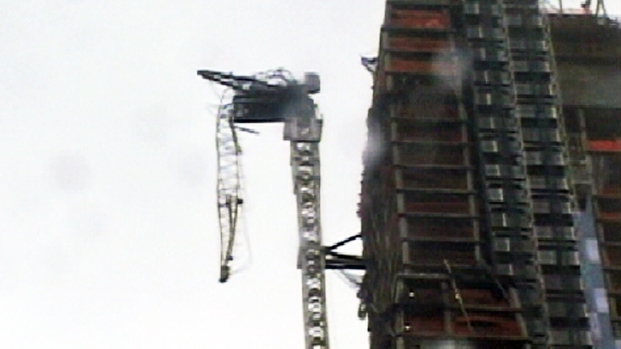 Sandy lookback: a construction crane atop luxury condo building 157 West 57th Street, between Sixth and Seventh avenues, collapses amid fierce winds Monday, Oct. 29, 2012. A part of a boardwalk floats through flooded streets in Rockaway Park, Queens, and power lines are knocked down on top of trees, sparking fires, after Sandy tore through. 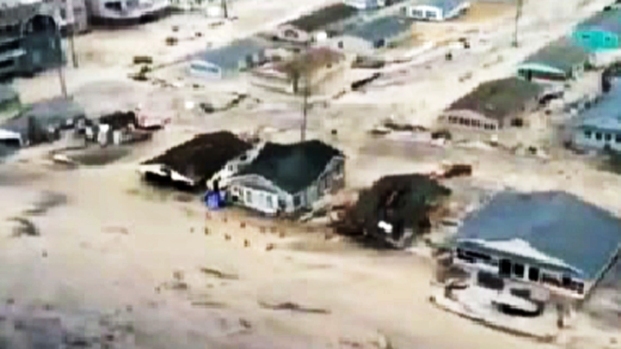 Three multi-million dollar homes along the Greenwich shoreline were destroyed by fire as Sandy made landfall. Greenwich fire officials said rescue units were able to save the residents and evacuate neighbors. 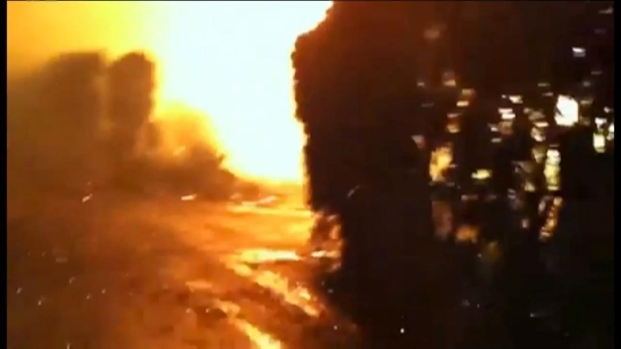 But video released by the town shows how the roaring flames, brutal winds and crashing surf made fighting the fires impossible. Firefighters used a boat to rescue 25 people from a huge fire in Queens after Sandy. A deer got stuck in the rocks and surf at a New Jersey beach as the water churned wildly. 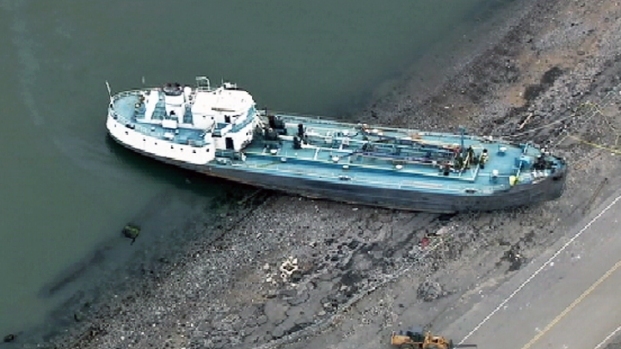 A 168-foot water tanker washed ashore on the east end of Staten Island, in the Clifton Stapleton section, after Sandy. The water tanker was pulled a mile from where it was originally docked. Here's an aerial view from Chopper 4. 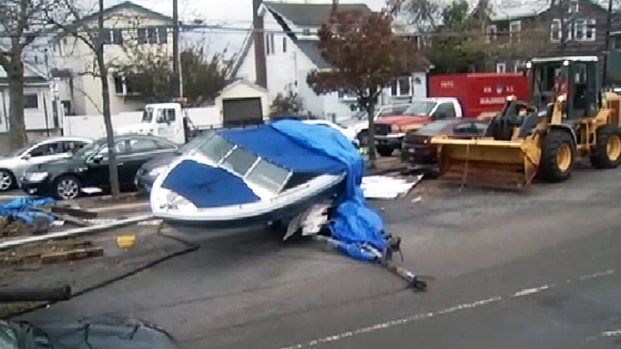 A 168-foot water tanker washed ashore on the east end of Staten Island, in the Clifton Stapleton section, after Sandy. The water tanker was pulled a mile from where it was originally docked. Here's an aerial view from News Chopper 4. Fierce winds and surging waters swept boats into the street on Cross Bay Boulevard in Broad Channel, connecting Howard Beach and Rockaway Beach in Queens. Fierce winds and surging waters swept boats into the street on Cross Bay Boulevard in Broad Channel, connecting Howard Beach and Rockaway Beach in Queens. Andrew Siff reports. 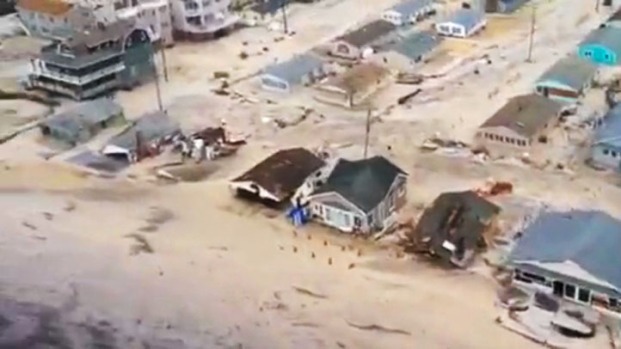 See aerial footage taken by the New Jersey National Guard showing the damage wrecked by Hurricane Sandy where it made landfall in Seaside Heights, N.J. 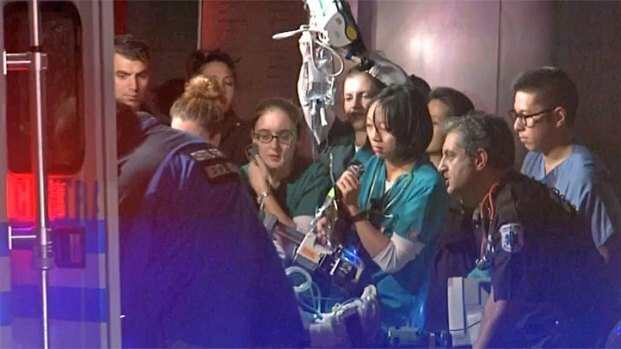 When power was lost to New York University hospital, dozens of first responders mobilized to evacuate the complex in lower Manhattan. New York City awakened the day after Sandy to a flooded subway system, shuttered financial markets and hundreds of thousands of people without power. In one part of the city, a flooded underground parking garage led to a six-car pileup.